In the early eighties Sir James Fletcher and Dr. Pat Moore, former medical officer of the Maori Battalion, were discussing the incidence of a condition known as "glue ear" in the families of the ex-servicemen. The pair had ridden together for many years with the Pakuranga Hunt and Sir James knew that Dr. Moore had always maintained an interest in the soldiers' welfare after the war. The doctor was concerned about the spread of the ailment, which can cause long-term hearing loss and speech difficulties. So he asked his old friend if the trust could help fund a nurse and caravan to visit schools in Rotorua and treat the sufferers. As it happened, Sir James was only too willing to help and the trust contributed what it could. Soon the incidence of glue ear began to decline. This was exactly the kind of cause the trust liked to support. It dispensed funds and helped raise them for a smorgasbord of worthy projects that covered sport, arts, heritage, conservation, education and medicine under one of its guiding principles. As the trustees had said from the very beginning: "We have an obligation to help each other succeed." 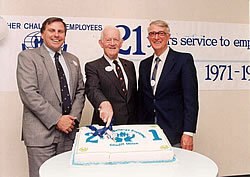 Sir James Fletcher does the honours at the Fletcher Challenge Employees Credit Union 21st birthday, October 1992. (member number two, John Hart (left) and the union's original manager, Alan Taylor). Sir James, who was chairman of the trust in its various forms for nearly half a century, had always interpreted that obligation broadly. Thus the grants regularly made the difference between success and failure for community-enriching but cash-starved projects such as historic museums, local art galleries, the restoration of heritage buildings, sporting events, support for the infirm and disabled, even the financing of local drama productions of particular merit. The trust's work reached into every corner of New Zealand and even beyond - the Chatham Islands has been a regular beneficiary. Even in the early eighties, the trust gave around $1 million every year to scores of projects that met its criteria, projects run by large-scale professional philanthropies as well as tiny, volunteer-run bodies. 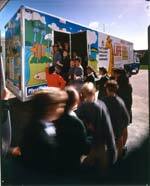 And although New Zealanders of all ages and background benefited from the trust, it was children most of all. As the trust's founding document notes: "The trust believes that while every community program has intrinsic value, those focused on the young have particular merit." AFTER the glue ear unit had been operating successfully for some time, the Variety Club took over its funding. But by then Pat Moore had another, more serious problem and once again he approached Sir James about it. Following an outbreak of meningitis in Rotorua, a number of children and older people became deaf and Dr. Moore wondered if the trust could find the money to pay for a new Australian invention that could restore hearing. This was the cochlear ear implant known as the Bionic Ear but the problem was it cost about $20,000 per person including treatment. The government, which was not convinced the device was effective, had turned Dr. Moore down. After satisfying itself that the implant really did work, the trust agreed to provide $40,000 to pay for the first two implants. Sir James then canvassed other charitable trusts to see if they could match this contribution. The first to respond was Maurice Paykel, pioneer of whiteware manufacturing in New Zealand, who pledged another $40,000 from his own trust. Shortly after, the ASB Trust provided $250,000. And, with $80,000 raised in a flash by private trusts anxious to help their fellow citizens, the government agreed to fund four operations a year. Almost overnight, a system was put in place that would restore the hearing of some of the men, women and children who had suffered from meningitis. THE FLETCHER TRUST, as it is now known, was established in 1943 in the middle of the Second World War. It was not then a charitable organisation but a superannuation plan that was unique for its time. The plan came in three parts: a subsidised superannuation scheme for salaried employees, a cash accumulation plan for the female staff, and a non-contributory scheme for male wage-earners known as Scheme C. It was from Scheme C that the modern trust emerged. The parent company was publicly-listed Fletcher Holdings, the booming Auckland-based construction-based business founded by Sir James' father, a Scot who had arrived in New Zealand with little more than a few quid, a bag of tools, and a determination to do well. The founder had done well. Indeed after helping rebuild the stricken city of Napier after the earthquake, launching the state house construction project, and becoming Commissioner of Defence Construction during the Second World War, he had already received a knighthood. Fletcher Holdings was a good company to work for and it automatically put male wage-earners into Scheme C after six months on the payroll. This was a non-contributory scheme under which the companies in the group paid in £5 per man per year, based on monthly payments of a twelfth of £5 for every employee on the books on the first of each month. As construction workers are often transitory, the levy was paid on behalf of a high proportion of employees who may have only been on the payroll for a month or less. Originally the scheme was a death benefit paying £300, a little over a year's wages for a tradesman, no questions asked. The firm did not wait for probate but paid out immediately to the next of kin. It later also offered an alternative retirement payment at age 60 and a £50 maternity bonus, well ahead of its time. At that time the first Sir James' son was just Jim Fletcher, an accountant and secretary of Fletcher Holdings whose numerous responsibilities happened to include Scheme C. The role of the young Fletcher and his fellow trustees was to administer Scheme C for the benefit of employees, which above all included investing the contributions wisely. Thus the trust put the funds into the factories and warehouses that the parent company was building all over New Zealand. When these were sold, usually at a handsome profit, Jim Fletcher banked the proceeds in the scheme against future calls on it. In effect it was a revolving fund. After a few years of this the fund became so affluent that Fletcher Holdings no longer required employees to contribute a cent into the scheme. By 1970, nearly 30 years after the scheme had been established, it was obvious that the income from the assets was so substantial that it could never be fully used for the original purpose of retirement and death benefits. Also it was feared the scheme might end up akin to a tontine arrangement - a common annuity fund in which the last few survivors take the vast majority of the proceeds. By now, Jim Fletcher was managing director of Fletcher Holdings, which had expanded considerably, but he continued to oversee the work of Scheme C with all his other responsibilities. In time he became convinced that the mounting surplus income should be applied to a greater good. So, as they were required by law, the trustees of the scheme sought and won Supreme Court approval to transfer part of the surplus to a trust providing medical and educational benefits to company employees, and especially to Maori and Polynesian employees. Thus the modern form of the trust began to take shape. Three years later, when it was clear that the scheme still had more than enough money to fully meet its liabilities, the balance of the surplus was transferred to the trust and it was able to distribute further funds. This worked well enough for the next few years but the investment policy had been so successful that the scheme continued to generate surplus funds, creating a dilemma. Under the strict terms of the deed, it was not possible for the trustees to disburse the proceeds as widely as they wished. As they noted, "the demands on the special purposes fund were minimal and the accumulation of surplus income and increased value of the assets were greatly exceeding the benefits and grants payable from the scheme." The investment policy was working almost too well. So in 1980 the deed was altered again to allow the trustees to give money under the much broader umbrella of "charitable purposes". Henceforth it could apply its funds more freely and widely to a whole range of deserving organisations involved in national culture and history, the advancement of education, relief for the disabled, medical and scientific research, the welfare of youth, and community programmes. Thus the trust's modern character was established. The trust also acquired a new name -- Fletcher Challenge Charitable Trust - which it took on after the parent company merged with rural-based Challenge Corporation. ALTHOUGH the range of beneficiary organisations was broad, all donations still had to follow firm criteria. The ground rules of giving were that any grants, for example, could only be given for current expenses or equipment and not for the "accumulation of large capital funds". Above all, grants were "for use within New Zealand or for a purpose which will result in a benefit to New Zealand." Sir James, had the same dislike of red tape that characterises many successful business people, developed an uncomplicated but effective processing system that released funds quickly for deserving applicants. The trust did not insist on a lot of paperwork -- there was no formal application form and people were encouraged to put a case in their own words. It gave decisions on appeals promptly. And it looked sympathetically at "start-up" funding for worthy but cash-starved projects because, as the trust acknowledges, "we regard start-up funding as an important contribution since we know how difficult it can be to launch even the most worthwhile project". The trustees knew this from their own experience because they regularly visited recipient organisations at first-hand and talked with volunteers and organisers about their difficulties. "Energy, enthusiasm and time are not what's missing - the problem is lack of finance," the secretary and treasurer of the Inangahua local historical committee once told them after obtaining a modest but crucial grant to help it commemorate the earthquake of June 16, 1929. In its first two years under the new name, the Fletcher Challenge Charitable Trust gave a total $2.5 million in grants. Some donations were for significant amounts but, because the trustees wanted to stretch the resources at their disposal as far as possible, many were for relatively modest sums. But as they well knew, $1500 here, $2000 there could galvanise a project and make all the difference. When, for instance, a delegation from a committee of old boys from Waitaki Boys high school visited Auckland to seek a donation for their centennial project, the trust readily agreed to support such a worthy cause. But on its return to Oamaru, the delegation discovered that the overall response to the project was so poor that there was talk of abandoning the appeal altogether. However when one committee member heard that the trust had chipped in, he said: "Well, if those bastards in Auckland can respond so well, we should be home and hosed." The centennial project was revived and went on to become a great success. There were still rules of giving, as required by law. While the trust set out to make it as easy as possible for people to apply for funds, it also insisted that grants be used within a year and it reserved the right to seek evidence of the spending of the grant in line with the terms of the application. And it was, almost without exception. THE trust however had much wider responsibilities than approving grants, even if it was to worthy causes. It was also accountable for some of the nation's finest art, a collection that had started in the early sixties in the most unlikely of circumstances. At that time one of Jim Fletcher's most valued -- and maverick -- employees was George Fraser. He had been briefly a Communist in London in the forties, later a Navy gunner in World War Two, and like Labour prime minister Walter Nash a member of the Fabian Society. Widely read with cultivated tastes, Fraser was assistant to the managing director, during the course of which he spent a lot of time walking around the firm's headquarters in Penrose. He came to dislike the cheap posters, calendars and other aesthetically low-quality illustrations hanging on office walls and he suggested to his boss that they raise the tone by hanging fine New Zealand art around the building instead. Not long afterwards, Peter Webb of art auctioneer George Walker happened to ring Jim Fletcher to ask if he was interested in buying five New Zealand watercolours by J.B.C.Hoyte, a nineteenth century painter. He certainly was, and he brought George Fraser along with him to inspect the paintings. "They were very good Hoytes", remembered Fraser in his memoirs. "And Jim and I bought them for something like £350." Delighted with their purchase, the pair brought the watercolours back to the firm's headquarters and hung them in the dining-room. As Fraser had hoped, employees began to take a close interest in the pictures. 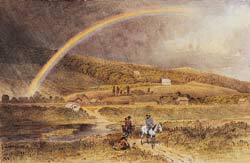 Seeing this, the pair decided to look for more New Zealand art and enlisted the aid of Jim Fletcher's wife, Vaughan. These three formed an unofficial art committee and went hunting for bargains. The year was 1962. 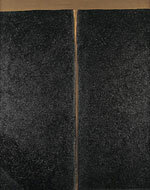 By the late sixties an important contemporary collection was beginning to take shape through the auspices of this unofficial art committee, with the purchase of paintings such as Colin McCahon's 1965 July Waterfall and Gordon Walter's 1967 koru painting, Tahi. And its members continued to buy paintings, including a significant collection of abstract works, under the guidance of experts Petar Vuletic and John Gow. Because they were by now well known in the galleries, they often had to resort to using other people to do the bidding to keep down the prices they paid. But as time went on, the collection became nationally significant, boasting paintings by early artists visiting New Zealand, by those who settled here, and by New Zealand-born artists of established and emerging reputations. In fact, a truly representative collection of art from the 1840s to the present day. Contemporaneously, Wellington-based Challenge had also been buying important paintings dating from the 1940s onwards and when the companies merged in 1981, there were thus two collections: Fletcher's and Challenge's. The latter had started mainly with landscapes but now had a large number of contemporary paintings acquired by Margaret Trotter, wife of the merged company's new chief executive, Ron Trotter. 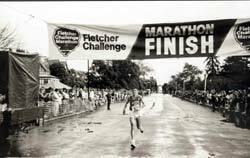 (At the merger Jim Fletcher, now Sir James in his turn, had retired to become president of Fletcher Challenge.) The enthusiastic Margaret Trotter had "bought widely and adventurously in the contemporary area", in art curator Peter Shaw's words. BY NOW, art work of a different kind was also on display in the company's buildings. These were remarkably fine ceramics and they were there because of the conviction of an executive "that industry had a moral responsibility to foster the arts, particularly those enduring financial burdens." That executive was Trevor Hunt, managing director of Fletcher Brownbuilt. As is so often the case with good works, the ceramics collection began from a chance conversation. A friend of Hunt's suggested a ceramics competition to help raise funds to provide premises in Auckland where pottery could be taught. Hunt was enthusiastic and, with company employees providing nearly all the manpower, the Fletcher Brownbuilt Pottery Award was launched in 1977 and became an immediate success. The first winner was Aucklander John Anderson who inadvertently showed how urgently potters needed financial support when he walked up to receive his prize of $2000 dressed in a sweater with holes at the elbows, patched jeans and gumboots. Within a couple of years, the competition attracted its first overseas entries. When Hunt retired in 1987, the award had become an essential date in the national arts calendar and the parent company recognised that it had to be maintained. So the trust assumed responsibility for managing the exhibition, the parent company provided the funds, and the exhibition went from strength to strength. By the nineties, when Fletcher Challenge subsidiary companies were based all over the world, the trust sought a more international audience for the award and soon it was attracting entries from Australia, USA, Japan, England, South America, and Europe, one of a handful of prestige international ceramic awards. Indeed there were sometimes more entries from overseas than from New Zealand. Up to 13,000 New Zealanders flocked to the exhibition every year and the international media gave it generous coverage. "In 20 years the standing of the exhibition has grown and grown," observed a judge, American John Chalke, one year. "It's one of the two, possibly three, best ceramics awards in the world." By then the original purpose of the exhibition had long been achieved. In the mid-nineties, Auckland Studio Potters moved into its second teaching premises constructed from the proceeds. With every passing year the trustees could see what a difference a few thousand dollars could achieve in the right hands. A group called Wairarapa Supergrans was able to find work for the unemployed in a high-unemployment area. Local branches of the Salvation Army provided more help for the infirm and disabled. Kerikeri Surfers, a 70-strong club for older people, bought a new computer to help them learn how to use the internet. Kapiti Players, which had created a permanent theatre out of a Fletcher Holdings warehouse, staged a 50 th birthday production. A brass band in Fielding bought $3000 worth of instruments. The volunteer surf life-saving club at Piha beach north of Auckland received $10,000 to help members save lives. A running club, Whangarei Harriers, erected lights for night-time races. A civic-minded committee in Hokitika on the west coast of the South Island began restoring the heritage Carnegie Library building. The Inangahua local history committee expanded its record of the great 'quake. Port Chalmers Museum expanded the unique maritime displays in its converted old stone post office. The National Trust of Scotland received a modest grant. A community education trust in the remote Chatham Islands spent $4000 on new computers and the services of a teacher. No, it did not take a lot of money to make a difference in the right hands. Isolated Maori settlements bought materials to build canoes and local youth orchestras purchased extra sheet music. St. John's Ambulance in Greymouth acquired two defibrillators and the family of a spastic quadriplegic near Wellington bought a computer with a head-operated switch. Some projects required more than one annual grant, like Frank Stark's New Zealand Film Archives which is preserving an historic collection of 26,000 films and videos for posterity. Without the trust's help these images would probably have been lost for ever. As a grateful Frank Stark acknowledged, "you are helping keep New Zealand's heritage alive and visible". Other projects stretch even further into the future. 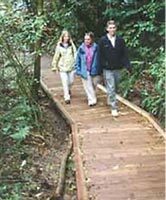 It is unlikely that even The Fletcher Trust will be able to see through the work of the Karori Wildlife Sanctuary whose commitment to restore the almost-lost beauty of a large valley just two kilometres from Wellington city centre will take about 500 years! Often these grants bridge the gap between despair and hope. "Your generous donation arrived at a very special time for us, as we had a shortfall which was causing us concern," wrote a volunteer organiser of the Mussel Bay Recreation Trust, Port Chalmers. "It means we can now proceed." And they did, building playgrounds, a BMX track, sheltered walkway and a boat ramp alongside existing sports grounds. Alongside the smaller donations, the trust also continued to give much larger sums of $50,000 or more to longer-established and often nationwide organisations. These included the New Zealand Sports Foundation, the Summer Science School attracting some of the nation's brightest students, New Zealand Principals Foundation and a special facility at Massey University for school principals, the Halberg Trust for crippled children, and the Rotorua marathon which was sustained for so long by the trust and other companies within Fletcher Challenge -- since 1965 in fact -- that it was often called "The Fletchers". And before other organisations took over responsibility for them, pledges for Maori scholarships could easily amount to $100,000 in any one year. Sir James' second son, after he became chief executive of Fletcher Challenge. 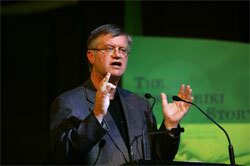 He urged that the trust become involved primarily in conservation, learning and young people. Thus a new trust-funded Corro (for correspondence) Club building on Great Barrier Island means that students from all over the island can come together to share ideas and knowledge under the one roof. Similarly, further south, children with special needs at Otaki Health Camp School received upgraded playground equipment. The Young Enterprise Scheme (YES) reflects the conviction of Sir James and fellow trustees that "in a healthy business environment everyone benefits". With senior executives often helping out, YES teaches commercial skills to secondary-school students by helping them launch, run and liquidate "businesses". It provides national finals for the most successful young entrepreneurs. The baby brother of YES, the Primary Enterprise scheme, helps younger school children acquire basic economic skills. And so do adult business people receive help through a nationwide mentoring organisation that began under the auspices of the trust. This is a free service that has saved scores and perhaps hundreds of small businesses from extinction. And like glue ear, it started with a conversation. This remarkable organisation had its origins through the offices of the eldest son of Sir James and Lady Fletcher. 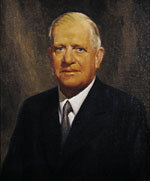 J.R. ("Jim") Fletcher was chairman of a successful Hamilton-based company named Woolrest, which made sheep skin car-seat covers among other products. One of the firm's executives was Dr. Graeme Craig, who had seen in action in Britain an enterprise called Business in the Community which operated under the very active presidency of the Prince of Wales. It was in effect a charity for business to which most of the UK's biggest companies belonged. Craig believed a similar organisation could work in New Zealand. At his son's suggestion, Sir James met with Craig who floated the idea of the trust sponsoring a New Zealand version of Business in the Community. Sir James was immediately enthusiastic. Although he had made his mark in big business, for example by founding the newsprint industry in New Zealand, he had often witnessed the devastating financial and emotional consequences of small business failure. If something could be done to bolster small business, he wanted to help. It was soon decided that the trust had the resources to run only one of the British organisation's programs, and certainly not all of them. And that program was the mentoring service for small business. The idea behind this was that retired and still-serving executives sit down with business-owners and, using their experience, try and fix problems in the many areas where these typically under-resourced firms need help. At first Business in the Community was necessarily run on a shoestring. Retired Fletcher employees including Lady Fletcher, who had worked as a secretary for her husband before marrying him, took over spare offices in Fletcher Construction on the corner of Penrose and Great South Roads. These volunteers answered the phones, took details and assigned executives called mentors (or trusted advisers) to troubleshoot problems in the industrial estates. Soon mentors were fanning out all over the city, often spending hours working with the owner and solving potentially serious problems. It was not unusual for captains of industry to turn up in small factories in industrial estates to offer advice to startled but grateful struggling businesspeople. In this way many companies on the brink of failure were saved. Later an alliance was formed with the Auckland Chamber of Commerce which wanted to establish a business advisory service and a Hastings school teacher named Graham Seatter, whose form had won the top YES award, became its first chief executive. Seatter set about expanding the program and within a few years had recruited national and regional members and agencies to provide a nationwide service. With a blue-chip board of diverse commercial skills under the chairmanship of Sir James, and ably assisted by scores of organisations giving money, time or help in kind, Business in the Community steadily spread its coverage from Whangarei to Invercargill. When Seatter moved on, his successors proved equally dynamic. It very quickly became clear how much New Zealand needed an organisation like Business in the Community. By 2000, it had recruited its 1000 th mentor and was signing up new ones at a rate of 30 every month. From more than a score of offices all over New Zealand, these mentors were providing help to 350 businesses a month without, in many cases, bothering to charge Business in the Community for their out-of-pocket expenses. The value of the service to small business was considerable -- at least $3 million if measured by even modest consultancy rates. Within another two years, the total economic contribution to the nation could be counted in tens of millions of dollars. By then Business in the Community agencies were mentoring nearly 5000 businesses a year and by 2003 some 50,000 firms had been mentored since the project was launched. AFTER the death of George Fraser in 1986, Lady Fletcher had taken over the curating role of the art collection. It was another of the many practical services she continued to provide gratis for the company. She had help from her husband, who still pored through art catalogues for bargains, and from others within art circles. They also continued to observe Fraser's philosophy that the art collection be a "live" one, and thus some of New Zealand's finest paintings still hung in the firm's offices where there could be no doubt that the tone had been raised. The aftermath of the stock market crash of 1987 served to illustrate the wisdom of the trust's relatively frugal buying policy. "During the nineties, a period which saw the dismantling of many of New Zealand's corporate art collections, the Fletcher Challenge collection continued to go from strength to strength", remembers art curator Peter Shaw. In that period the Auckland art committee, scouring catalogues, attending sales and following up tips that sometimes turned up valuable art lying forgotten in obscure places, was able to take advantage of lower prices to expand its collection of early, established and emerging artists, and to fill gaps in the collection. Thus it came to embody a veritable history of New Zealand art. The trustees never lost their speed off the mark. When in 2002 they learned through the grapevine of a large collection of paintings by the watercolourist, John Kinder, that had not seen the light of day for 30 years, they promptly investigated and just as quickly bought them . 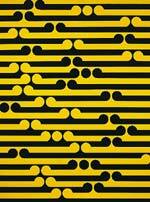 Soon afterwards, the new-found art was made available for an exhibition in the Auckland Art Gallery. As the collection grew, it became so culturally valuable that it clearly required a more formal structure to administer the paintings, especially when it was decided to headquarter Fletcher Challenge in Auckland. So an official four-person art committee was established, formed of Sir James as chairman and three senior company executives. The first job was to write a mission statement that reflected Fraser's commitment to put the art on display. Second, they appointed a full-time art curator in the person of Peter Shaw. Third, the combined collection including the ceramics was placed under the umbrella of the Fletcher Challenge Charitable Trust, which administered it for an annual fee from the parent company and hung the works in offices, hallways and conference rooms around the firm's headquarters. The day of July 1, 1991, became a red-letter one for Sir James and his wife, for Margaret Trotter and, posthumously, for George Fraser. On that date the paintings from Wellington joined the ones already hanging on the walls of the Penrose headquarters. Vaughan Fletcher and Margaret Trotter formally handed over the accumulated documentation of the collection to the new curator, and Peter Shaw began the immensely rewarding task of making the most of the hundreds of painting and lithographs. He catalogued them, arranged for their loan to galleries so they could be displayed to the widest possible public, gave art lectures to staff, and mounted exhibitions. In short, exactly what George Fraser would have wanted. FROM the late nineties the future of the trust changed dramatically when parent company Fletcher Challenge underwent a major transformation. In simple terms it was broken up and most of its subsidiaries sold. Almost overnight the trust lost its protective umbrella and had to restructure itself. In these circumstances it was essential to protect for posterity the whole philanthropic ethos of the trust, but also to preserve the assets it had created over more than half a century. The first thing to be done was change the name. Thus in 2001, it adopted the title of The Fletcher Trust, a proud name that recalled the three generations of the family who had run the parent company for the best part of a century. It was also a name that, by severing all links with the parent company including its right to select trustees, gave the trust an independence it had never had. Henceforth it had a new and exciting life of its own. Inevitably there were many administrative details to tidy up, for instance over the art collection. Before the break-up, the parent company had transferred the art collection to the trust. At the same time it made an interest-free loan to the trust to buy back the collection, and agreed to pay associated costs such as the curator's salary. In return the trust was to continue to hang the paintings in company buildings. But as an international recession took hold and money became tight, that arrangement was superseded by events. Its obligation to be primarily accountable to public shareholders obligated the parent company to require that the loan be repaid almost immediately, which Fletcher Trust did. Further, with Fletcher Challenge companies having been sold, the trust had lost the space where it had always hung its paintings. Because the trustees from George Fraser on had always prided themselves on the fact that all the art was on show, this created a dilemma. They had somehow to find new walls on which to hang the paintings. This lead to the organisation of more outside exhibitions. But there were other issues such as Fletcher Challenge's archives. This was an immense treasure trove of commercial documents - books, letters and photographs -- from some 450 companies dating back to the birth of the nation. Out of respect for the past, the parent company had preserved this mountain of material at considerable expense, but now the break-up of the company threatened its safety and it was logical that the trust should assume the responsibility. After all, it had long been the custodian of the parent company's other heritage assets, including its commitment to the community at large. Thus the trust became the storehouse of these valuable documents and, with archivist Dorothy Neilson in charge , immediately set in train a plan to make them widely available through an electronic database within the trust's own website. This became a two-year job but it was worth it. The website not only incorporates the activities and interests of The Fletcher Trust, it is a storehouse of the invaluable archives that will be of immense value to students, researchers and other archivists, and it is a showcase of the art collection that has attracted interest from around the world. Then there were the retiree clubs. Since the early eighties Fletcher Challenge had run these clubs for former employees, organising functions for them and helping them stay in touch. But without a parent company, that was clearly impossible. So the trust gladly took over this responsibility too, providing the clubs with computers and other resources. After all, the trustees reasoned, there is no heritage more important than a former employee. Once all this was done and the trust completely separated from the mother ship, it actually found itself in a stronger position than before. "We were better placed than ever to help others succeed", Sir James said. IN 1909 the young immigrant from Scotland, James Fletcher, and his partner at the time, Albert Morris, won a contract to build a house. It was destined for the storekeeper in Broad Bay on the Otago Peninsula and the young builders were proud of getting the work. They had been asked to build a typically modest family home of the era, in the style of an Edwardian villa, and they were determined to do a good job. As James Fletcher would later tell his son: "Never do a job you have to run past later." It turned out to be a simple but lovely house. Standing on a bank above the inlet, overlooking the water, it had a generous front verandah and tall windows under a gabled roof. Fletcher and Morris did not make much of a profit on the contract - just 3 shillings and six pence - but they did such a good job that the house was still being used as a family home in 1990. That was the year the trust bought the old storekeeper's house and set about restoring it as a tribute to the original James Fletcher, the man who went on to found the parent company. The home was given a new lease of life -- repaired, repainted and re-furnished in the style of the period. Then it was made available to the public, the first such villa in New Zealand, under the management of the Otago Peninsula Trust. And so does its owner have a new lease of life under Sir James' son Angus. The art collection is now available to an infinitely wider world, the former parent company's archives and employees' clubs are under its guardianship, and The Fletcher Trust is free to continue with its philanthropic activities and help thousands more New Zealanders.